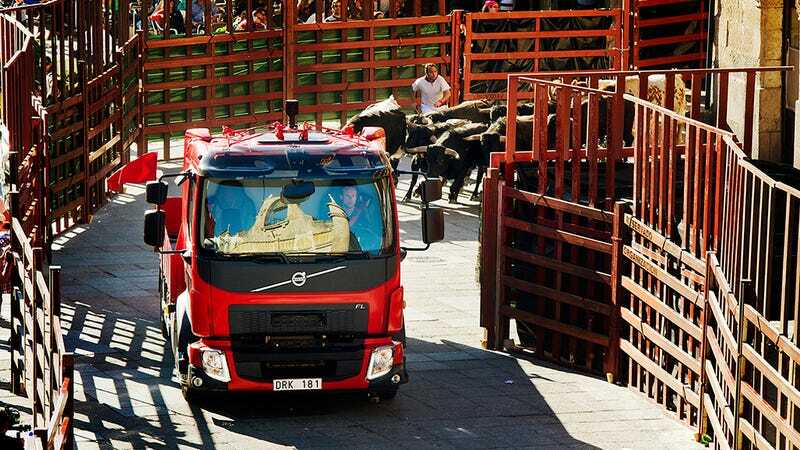 For their latest stunt, Volvo took an FL distribution truck to the medieval Spanish town of Ciudad Rodrigo to be chased by a herd of bulls. This is a 12-tonne toreador in action. Volvo chose Youtube to show the world Scandinavians know trucks better. Their new FL series is easy to steer, rides well and can tow heavy stuff. As it turns out, it's also fast enough to beat some angry bulls in a race through a very narrow Mediterranean town, accompanied by a bunch of crazy individuals dressed in white. Hoon of the day? I think so! Expect to see crazy fast deliveries powered by Volvo from a store near you.